We are offering Cane Rattan Basket. 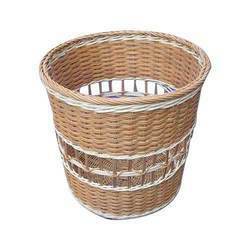 We offer polyrattan baskets to serve breads, confectioneries, cookies, fruits, chocolates & lot many other food & non food items. They are also used for gift packings & imparts a very stylish look. We specialize in offering an enticing range of Rattan Storage Baskets, which is available in various color combinations, designs and sizes. Aesthetically designed, it is highly durable and used in hotels, canteens & other areas. Our collection of Rattan Storage Baskets perfectly matches the individual requirements of our clients and can also be availed at competitive prices. Rattan Basket available in Oval, Round, Rectangle and Square shape with Good Quality.